"If Palamas Is A Saint, Then Let Him Drown Us"
A Biochemical Link Between Misery and Death? Should We Promote Faithlessness in Our Churches? Why Do Orthodox Constantly Seek God's Mercy? Is Your Bod Flawed by God? What Difference Does God Make Today? Three Little Bops: A Warner Brothers Conspiracy? Fusing Orthodox and Pentecostal Worship??? On Meatfare Sunday, as we prepare for the commencement of the Holy and Great Lent, "we commemorate the Second and Incorruptible Coming of our Lord Jesus Christ". The expression "we commemorate" confirms that our Church, as the Body of Christ, re-enacts in its worship the Second Coming of our Lord as an "event" and not just something that is historically expected. The reason is that through the Divine Eucharist, we are transported to the celestial kingdom, to meta-history. 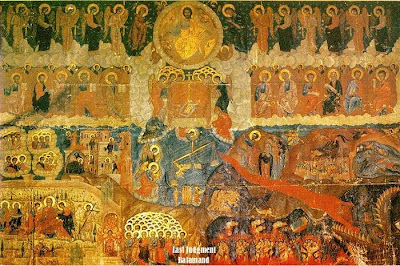 It is in this Orthodox perspective that the subject of paradise and hell is approached. In the Gospels (Matt. 5), mention is made of "kingdom" and "eternal fire". In this excerpt, the "kingdom" is the divine destination of mankind. The "fire" is "prepared" for the devil and his angels (demons), not because God desired it, but because they are without repentance [i.e., unwilling to turn, to re-think, and participate in redemption]. The "kingdom" is "prepared" for those who remain faithful to the will of God. The uncreated glory is paradise (the "Kingdom"). "Eternal fire" is hell (v.46). At the beginning of history, God invites man into paradise, into a communion with His uncreated Grace. At the end of history, man has to face both paradise and hell. We shall see further down what this means. We do however stress that it is one of the central subjects of our faith — it is Orthodox Christianity's "philosopher's stone." Mention of paradise and hell in the New Testament is frequent. In Luke 23:43, Christ says to the robber on the cross: "Today you will be with me in paradise". However, the robber also refers to paradise when he says: "Remember me, Lord…in your kingdom". According to Theophylact of Bulgaria (PG 123, 1106): "For the robber was in paradise, in other words, the kingdom". The Apostle Paul (2 Cor.12:3-4) confesses that, while still in this lifetime, he was "swept up to paradise and heard unspoken words, which are impossible for man to repeat." In Revelation, we read: "To the victor, I shall give him to eat of the tree of life, which is in the paradise of my God" (2:7). And Arethas of Caesaria interprets: "Paradise is understood to be the blessed and eternal life" (PG 106, 529). Paradise, eternal life, kingdom of God, are all related. References on hell: Matthew 25:46 ("to everlasting torment"), 25:41 ("everlasting fire"), 25:30 ("the outermost darkness"), 5:22 ("the place of fire"). 1 John 4:18 ("…for fear contains toment"). These are ways that express what we mean by "hell". Paradise and hell are not two different places. Such an idea is an idolatrous concept. Rather they signify two different conditions [ways or states of being], which originate from the same uncreated Source, and are perceived by man as two, differing experiences. More precisely, they are the same experience, except that they are perceived differently by man, depending on his internal state. This experience is the sight of Christ in the uncreated light of His divinity, of His "glory". From the moment of His Second Coming, through to all eternity, all people will be seeing Christ in His uncreated light. That is when "those who worked good deeds in their lifetime will go towards the resurrection of life, while those who worked evil in their lifetime will go towards the resurrection of judgment" (Jn.5:29). In the presence of Christ, mankind will be separated (like "sheep" and "goats", to His right and His left). In other words, they will be discerning in two separate groups: those who will be behold Christ as paradise (the "exceeding good, the radiant") and those who will be looking upon Christ as hell ("the all-consuming fire" of Hebrews 12:29). Paradise and hell are the same reality. This is what is depicted in the portrayal of the Second Coming. From Christ, a river of fire flows forth. It is radiant like a golden light at the upper end of it, where the saints are. At its lower end, the same river is fiery, and it is in that part of the river that the demons and the unrepentant ("the never repentant" according to a hymn) are depicted. This is why in Luke 2:34 we read that Christ stands "as the fall and the resurrection of many". Christ becomes the resurrection into eternal life for those who accepted Him and who followed the means given for the healing of the heart. To those who rejected Him, however, He becomes their separation and their hell. Among the patristic testimonies, Saint John of Sinai (of the Ladder) says that the uncreated light of Christ is "an all-consuming fire and an illuminating light". Saint Gregory Palamas (E.P.E. II, 498) observes: "Thus, it is said, He will baptize you by the Holy Spirit and by fire: in other words, by illumination and judgment, depending on each person's predisposition, which will in itself bring upon him that which he deserves." Elsewhere, (Essays, P. Christou Publications, vol.2, page 145): The light of Christ, "albeit one and accessible to all, is not partaken of uniformly, but differently". Consequently, paradise and hell are not a reward or a punishment(condemnation), but the way that we individually experience the sight of Christ, depending on the condition of our heart. God doesn't punish in essence, although, for educative purposes, the Scripture does mention punishment. The more spiritual that one becomes, the better he can comprehend the language of Scripture and Sacred Tradition. Man's condition (clean, unclean, repentant, unrepentant) is the factor that determines the acceptance of the Light as "paradise" or "hell". The anthropological issue in Orthodoxy is [to provide] that man will eternally look upon Christ as paradise and not as hell; that man will partake of His heavenly and eternal "kingdom". This is where we see the difference between Christianity as Orthodoxy and the various other religions. The other religions promise a certain "blissful" state, even after death. Orthodoxy however is not a quest for bliss, but a cure from the illness of religion, as the late Father John Romanides so patristically teaches. Orthodoxy is an open hospital within history (a "spiritual infirmary" according to Saint John the Chrysostom), which offers the healing (catharsis) of the heart, in order to finally attain theosis — the only desired destination of man. This is the course that has been so comprehensively described by Father John Romanides and the Rev. Metropolitan of Nafpaktos, Hierotheos (Vlachos); it is the healing of mankind, as experienced by all of our Saints. This is the meaning of life in the body of Christ (the Church). This is the Church's reason for existence. This is what Christ's whole redemptory work aspired to. Saint Gregory Palamas (Fourth Homily on the Second Coming) says that the pre-eternal will of God for man is "to find a place in the majesty of the divine kingdom" — to reach theosis. That is the purpose of creation. And he continues: "But even His divine and secret kenosis, His Theanthropic conduct, His redemptory passions, and every single mystery (in other words, all of Christ's work on earth) were all providentially and omnisciently pre-determined for this very end [purpose]. The important reality, however, is that not all people respond to this invitation of Christ, and that is why not everyone partakes in the same way of His uncreated glory. This is taught by Christ, in the Parable of the Rich Man and Lazarus (Lk. 16). Man refuses Christ's offer, he becomes God's enemy and rejects the redemption offered by Christ (which is a blasphemy against the Holy Spirit, because it is within the Holy Spirit that we accept the calling of Christ). This is the "never repentant" person referred to in the hymn. God "never bears enmity", the blessed Chrysostom observes; it is we who become His enemies; we are the ones who reject Him. The unrepentant man becomes demonized, because he has chosen to. God does not desire this. Saint Gregory Palamas says: "…for this was not My pre-existing will; I did not create you for this purpose; I did not prepare the pyre for you. This undying pyre was pre-fired for the demons who bear the unchanging trait of evil, to whom your own unrepentant opinion attracted you." "The co-habitation with mischievous angels is voluntary" (Fourth Homily on the Second Coming) In other words, it is something that is freely chosen by man. Both the rich man and Lazarus were looking upon the same reality, i.e., God in His uncreated light. The rich man reached the Truth, the sight of Christ, but could not partake of it, as Lazarus did. The poor Lazarus received "consolation", whereas the rich man received "anguish". Christ's words for those still in this world, that they "have Moses and the prophets," signifies that we are all without excuse. For, we have the Saints, who have experienced theosis and who call upon us to accede to their way of life so that we too might reach theosis as they have done. We therefore conclude that those who have chosen evil ways (like the rich man) are without an excuse. Our orientation toward our fellow man is indicative of our inner state, and that is why this will be the criterion of Judgment Day during Christ's Second Coming (Matt. 25). This does not imply that faith, or man's faithfulness to Christ is disregarded; faith is naturally a prerequisite, because our stance toward each other will show whether or not we have God within us. The first Sundays of the Triodion preceding Lent revolve around relationships with our fellow man. On the first of these Sundays, the outwardly pious Pharisee justifies himself and denigrates the Tax Collector. On the second Sunday, the older brother (a repetition of the seemingly pious Pharisee) is sorrowed by the salvation of his brother. Likewise, seemingly pious, he too had false piety, which did not produce love. On the third Sunday, this condition reaches Christ's seat of judgment, and is evidenced as the criterion for our eternal life. The experience of paradise or hell is beyond words or the senses. It is an uncreated reality, and not a created one. The Latins invented the myth that paradise and hell are both created realities. It is a myth that the damned will not be able to look upon God; just as the "absence of God" is equally a myth. The Latins had also perceived the fires of hell as something created. Orthodox Tradition has remained faithful to the Scriptural claim that the damned shall see God (like the rich man of the parable), but will perceive Him only as "an all-consuming fire". The Latin scholastics accepted hell as punishment and the deprivation of a tangible vision of the divine essence. Biblically and patristically however, "hell" is understood as man's failure to cooperate (synergy) with Divine Grace, in order to reach the illuminating vision of God (which is paradise) and unselfish love (following 1 Cor.13:8): "love….. does not demand any reciprocation". Consequently, there is no such thing as "God's absence," only His presence. That is why His Second Coming is dire ("O, what an hour it will be then", we chant in the Praises of Matins). It is an irrefutable reality, toward which Orthodoxy is permanently oriented ("I anticipate the resurrection of the dead…"). The damned — those who are hardened at heart, like the Pharisees (Mark 3:5 - "in the callousness of their hearts") — eternally perceive the pyre of hell as their salvation! It is because their condition is not susceptible to any other form of salvation. They too are "finalized" – they reach the end of their road — but only the righteous [sincerely pious] reach the end as redeemed persons. The others finish in a state of condemnation. "Salvation" to them is hell, since in their lifetime, they pursued only pleasure. The rich man of the parable had "enjoyed all of his riches". The poor Lazarus uncomplainingly endured "every suffering". The Apostle Paul expresses this (1 Cor. 3:13-15): "Each person's work, whatever it is, will be tested by fire. If their work survives the test, then whatever they built, will be rewarded accordingly. If one's work is burnt by the fire, then he will suffer losses; he shall be saved, thus, as though by fire." The righteous and the unrepentant shall both pass through the uncreated "fire" of divine presence, however, the one shall pass through unscathed, while the other shall be burnt. He too is "saved", but only in the way that one passes through a fire. Euthymios Zigabenos (12th century) observes in this respect: "God is fire that illuminates and brightens the pure, and burns and obscures the unclean." And Theodoret of Cyrus regarding this "saving" writes: "One is also saved by fire, being tested by it, just as when one passes through fire. If he has an appropriate protective cover, he will not be burnt, otherwise, he may be `saved', but he will be charred!" Consequently, the fire of hell has nothing in common with the Latin "purgatory", nor is it created, nor is it punishment, or an intermediate stage. A view point such as this is virtually a transferal of one's accountability to God. But the accountability is entirely our own, whether we choose to accept or reject the salvation, the healing, that is offered by God. "Spiritual death" is the viewing of the uncreated light, of divine glory, as a pyre, as fire. Saint John Chrysostom in his 9th homily on First Corinthians, notes: "Hell is never-ending…sinners shall be brought into a neverending suffering. As for the `being burnt altogether,' it means this: that he does not withstand the strength of the fire." And he continues: "And he (Paul) says it means this: that he shall not be burnt, like his works, into nothingness, but he shall continue to exist, but within that fire. He therefore considers this as his `salvation.' For it is customary for us to say `saved in the fire,' when referring to materials that are not totally burnt away." Scholastic perceptions and interpretations which, through Dante's work (Inferno) have permeated our world, have consequences that amount to idolatrous concepts. An example is the separation of paradise and hell as two different places. This has happened because they did not distinguish between the created and the uncreated. Equally erroneous is the denial of hell's eternity, with the idea of the "restoration" of all, or the concepts surrounding the idea of Bon Dieu [God is Good]. God is indeed "benevolent" (Mt. 8:17), since He offers salvation to everyone: ("He desires that all be saved….." 1 Tim. 2:4). However, the words of our Lord as heard during the funeral service are formidable: "I cannot do anything on My own; as I hear, thus I judge, and My judgment is just" (Jn. 5:30). Equally manufactured is the concept of theodicy, which applies in this case. Everything [all responsibility] is ultimately attributed to God alone, without taking into consideration man's cooperation (synergy) as a factor of redemption. Salvation is possible only within the framework of cooperation between man and divine grace. According to the blessed Chrysostom, "the utmost, almost everything, is God's; He did however leave something little to us." That "little something" is our acceptance of God's invitation. The robber on the cross was saved, "by using the key request of 'remember me'…"! Also idolatrous is the perception of a God becoming outraged against a sinner, whereas we mentioned earlier that God "never shows enmity". This is a juridical perception of God, which also leads to the prospect of "penances" in confessions as forms of punishment, and not [epitimia] as medications, as means of healing. The mystery of paradise-hell is also experienced in the life of the Church in the world. During the Holy Mysteries/Sacraments, there is a participation of the faithful in divine grace, so that grace may be activated in our lives, by our course towards Christ. Especially during the Holy Eucharist, the uncreated (Holy Communion) becomes either paradise or hell within us, depending on our condition. Primarily, our participation in Holy Communion is a participation in either paradise or hell, in our own time and place. That is why we beseech God, prior to receiving Holy Communion, to render the Precious Gifts "not as judgment or condemnation" within us, but "for the healing of soul and body," not as "condemnation. " This is why participation in Holy Communion is linked to the overall spiritual course of life of the faithful. When we approach Holy Communion uncleansed and unrepentant, we are condemned (burnt). Holy Communion inside us becomes the "inferno" and "spiritual death" (see 1 Cor. 11:30, etc.). Not because it is transformed into those things of course, but because our own uncleanliness cannot accept Holy Communion as "paradise." Given that Holy Communion is called "the medicine of immortality" (Saint Ignatius the God-bearer, 2nd century), the same thing exactly occurs as with any medication. If our organism does not have the prerequisites to absorb the medication, then the medication will produce side-effects and can kill instead of heal. It is not the medication that is responsible, but the condition of our organism. It must be stressed, that if we do not accept Christianity as a therapeutic process, and its Holy Mysteries/Sacraments as spiritual medication, then we are led to a "religionization" of Christianity; in other words, we "idolatrize" it. And unfortunately, this is a frequent occurrence when we perceive Christianity as a "religion." Besides, this lifetime is evaluated in the light of the twin criterion of paradise-hell. "Seek first for the kingdom of God and His righteousness," Christ teaches us (Mt. 6:33). Saint Basil the Great says in To The Youth (ch.3) "Everything we do is in preparation of another life." Our life must be a continuous preparation for our participation in paradise – our communion with the Uncreated (Jn. 17:3). Everything begins from this lifetime. That is why the Apostle Paul says: "Behold, now is the opportune time. Behold, now is the day of redemption" (2 Cor.6:2). Every moment of our lives is of redemptive importance. Either we gain eternity, the eternal community with God, or we lose it. This is why oriental religions and cults that preach reincarnations are injuring mankind: they are virtually transferring the problem to other (nonexistent of course) lifetimes. The thing is, however, that only one life is available to each of us, whether we are saved or condemned. This is why Basil the Great continues: "We must proclaim that those things therefore that lead us towards that life should be cherished and pursued with all our strength; and those that do not lead us to that destination, we should disregard, as something of no value." Such are the criteria of the Christian life. A Christian continuously chooses whatever favours his salvation. We gain paradise or lose it and end up in hell, already during our lifetime. That is why John the Evangelist says: "For God sent not His Son into the world to condemn the world; but that the world through Him might be saved. He that believeth on Him is not condemned: but he that believeth not is condemned already, because he hath not believed in the name of the only begotten Son of God" (Jn. 3:17-18). However, this is also the way that our mission is directed: What are we inviting people to? To the Church as a [spiritual] hospital/therapy Centre, or just an ideology that is labelled "Christian"? More often than not, we strive to secure a place in "paradise", instead of striving to be healed. That is why we focus on the rites and not on therapy. This of course does not signify a devaluing of worship. But, without ascesis (spiritual exercise, ascetic lifestyle, acts of therapy), worship cannot sanctify us. The grace that pours forth from it remains inert inside us. Orthodoxy doesn't make any promises to send mankind to any sort of paradise or hell; but it does have the power — as evidenced by the incorruptible and miracle-working relics of our saints (incorruptibility=theosis) — to prepare man, so that he may forever look upon the Uncreated Grace and the Kingdom of Christ as Paradise, and not as Hell.